Ada pertanyaan untuk Chengdu Lemon Inn? Bagi para wisatawan yang ingin menjelajahi kota Chengdu, Chengdu Lemon Inn adalah pilihan yang sempurna. Terletak hanya 0.1 km dari pusat kota, para tamu berada di tempat strategis untuk menikmati obyek wisata dan aktivitas di kota ini. Dengan lokasinya yang strategis, hotel ini menawarkan akses mudah ke destinasi yang wajib dikunjungi di kota ini. 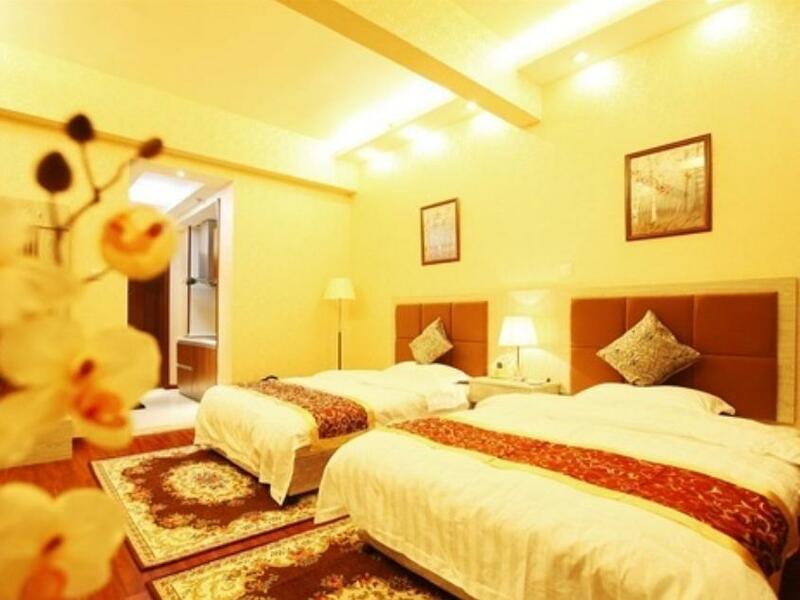 Dengan menawarkan pelayanan superior dan sejumlah fasilitas kepada para tamu hotel, Chengdu Lemon Inn berkomitmen untuk memastikan penginapan Anda senyaman mungkin. Ada beberapa fasilitas hotel ini seperti layanan kamar 24 jam, WiFi gratis di semua kamar, fasilitas untuk tamu dengan kebutuhan khusus, Wi-fi di tempat umum, parkir valet. Masuki salah satu dari 45 kamar yang menggoda ini dan lepaskan rasa penat Anda dengan sejumlah fasilitas yang tersedia seperti televisi layar datar, akses internet - WiFi, akses internet WiFi (gratis), kamar bebas asap rokok, AC. Hotel ini menawarkan fasilitas fantastis, termasuk kolam renang luar ruangan, kolam renang dalam ruangan, kolam renang anak, taman, untuk membantu Anda bersantai setelah sepanjang hari beraktivitas di kota. Temukan paduan menarik dari pelayanan profesional dan sejumlah fasilitas di Chengdu Lemon Inn. For someone without Chinese language skills I think this is not the place to stay. I had to change rooms twice before I had wifi that worked (I needed it to submit an application) and even though the staff were nice, they were pretty clueless at what to do. The beds weren't clean and rather dysfunctional neighbours could be heard at all hours of the night. I arrived quite late at the hotel (inform the staff in advance).the staff on duty told me that the twin room I booked is not available that night, I either leave or change the room to double room.It was already midnight, I was too tired to argue with her.I accepted and the only thing I request is one more linen because there were two people at the time and we can't be in one linen on one bed I would be awkward.but the staff refuse to give me another linen.the most unacceptable thing is her attitude ,it was just rude and unbearalbe.I will definetely not go back there again.ps.the room is so damp and shabby.stay away from there! It is an impressive hotel in Chengdu. The staff are very nice and eager to provide help and information to me. It is very good that there is a kitchen and washing machine inside the room. However, the exact entrance of the hotel is quite difficult to find and an insect is found in the room. Overall cleanness of the room is acceptable. This hotel was a blessing! Yes it was a little odd to find the check-in (on the 15th floor in a regular room marked with the red Chinese banners) but check-in was quick and easy and we were so grateful to get to our room (we stayed in two different rooms during our stay). We had a kitchenette with a small stove and sink area which was nice but we didn't use much because there are a lot of restaurants nearby. However, the blessing was the washing machine! After traveling for almost 2 weeks it was so nice to be able to wash and dry our dirty clothes and shoes! The bed was very big and comfortable as was the bathroom. It is not the most up-to-date hotel, there are some water stains on the walls and other little things that show that it's not a new hotel or one that is in pristine condition but it was clean and comfortable. My only complaint is the hotel staff seems to be a family that lives in the check-in office and often the door was locked and you had to knock a few times to get them to come to the door (often looking sleepy) and when we needed a new bedsheet it took a few tries to get it. However, if you're self-sufficient then this hotel is well worth the money - easy for taxis to find, great location for walking exploration, and easy to get a taxi. The Lemon Inn is centrally located and the room has every accommodation that you might need; a kitchen, a large bathroom, wifi, a TV. The only problem is that it was a little hard to find. It was a little hard to find and the staff did not really speak English but the room was in a great location and very spacious and accommodating. The reception area is on the 15th floor at room 20 (1520). If you arrive too early wait for someone to come out of the 1st floor to enter the elevator area. Rooms normally are available after 11. Nice rooms with nearly everything. Be reminded that if you require your rooms to be cleaned everyday you need to tell the lady at the reception everyday. if not they will not come into the room. My last day stay with lemon inn was the worst, i stayed on 32 floor, halfway while bathing, the supply of water just cut off, even till hours later, still no water supply. the room was average, little old, need some reno, staff was friendly, no room service, no phone line, housekeeping will not be done unless u call them to. Room is a bit old, need some touch up, corridor lighting not so bright, reception is at level 15, need card access to it in check in first day, so have to wait for chance to follow in, but overall stay is good. These value hotels are often unmarked from the outside. The taxi drivers don't know them at all. None of the shopkeepers and vendors know this one, not even on the same street. Finally, the manager of another 'hotel' in the same building had heard the name of lemon inn. He thought it might be in the building. I randomly guessed the 15th floor, and started knocking on doors. I saw an open door with a basket of lemons on the floor and there it was (I got lucky). You have to allow (and encourage) these smaller outfits without their own street-level presence to be more precise with directions. They don't always pick up the phone when you call, and they don't often speak English if they do pick up the phone. Very courteous and easy to deal with once you find the place. Overall, apart from the frustration of walking from door to door at the start, I'm very happy with the stay. Great location, and a clean large room. The hotel was hard to find. It was on the 15 th floor of a 20 or 30 story building. But once I found it the staff were very friendly. They spoke very little English, I had a tour booked in the morning and needed them to call the tour company to tell the how to get to the hotel. So after a half hour on google translator it all worked out. The room was very clean and quite large. Thank you. At first, we had trouble finding the hotel since our Agoda booking only gave a building number. Turned out the exact floor & suite number were written in Chinese. We finally was able find the reception desk located on the 15th floor. Checkin was a breeze except for language issue - the reception guy could not speak English so everything was done via sign language or Google translate. Loved the room - it came with a small kitchen where we would boil water for drinks. Overall, the room was comfortable for the price. the hotel is a little difficult to locate due to the lack of signage. however, the street address is clear so make your way up the elevator and look for the reception. this is an apartment building, and each "hotel room" is a whole self-contained apartment. heating was very effective in the frigid cold, and included a washing machine and full kitchen. 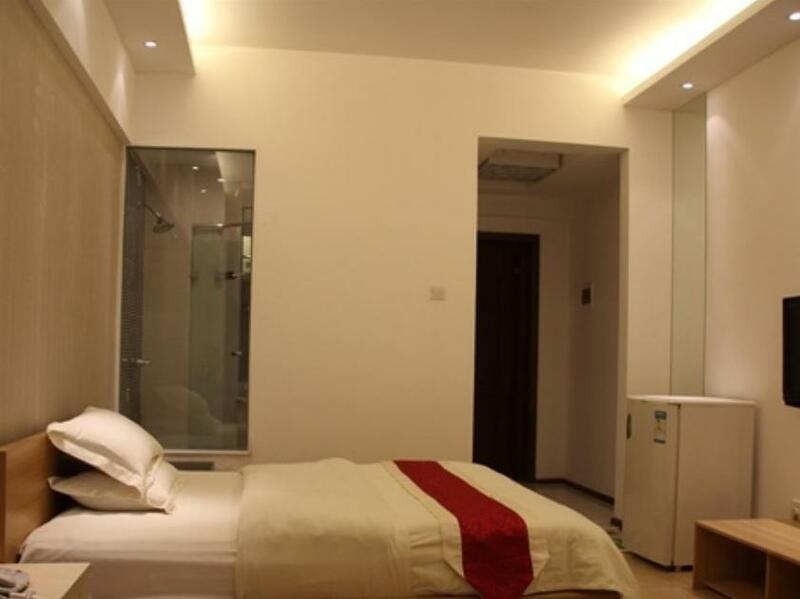 location is in the centre of the city and could not be better for the low price that i paid. It took us about an hour to find the reception of the hotel. It turned out to be a room on floor 15 of a residential/commercial building. The rooms were OK but the washing machine did not work. Nobody in the staff spoke English. Spacious clean and cheap room. Exceed expectation. 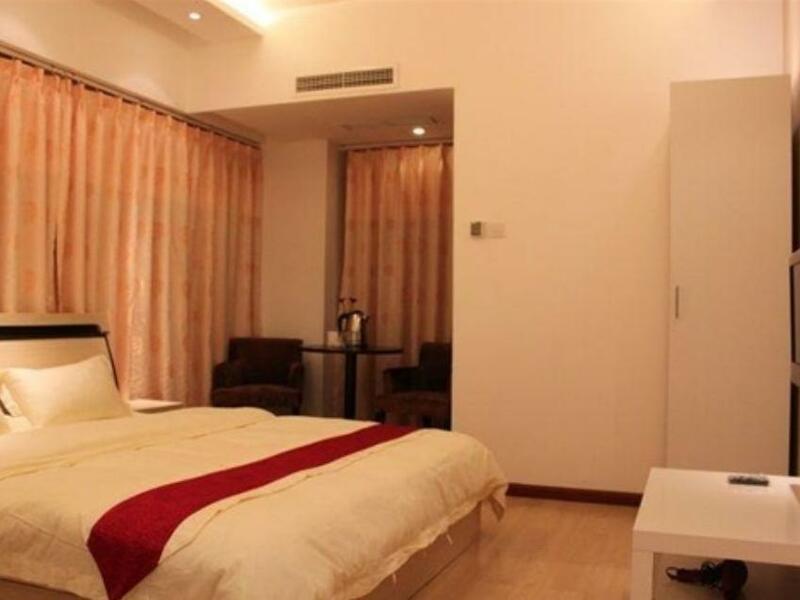 The only downside is the hotel is quite difficult to find as its reception is not on the ground floor but located in one of the rooms of the service apartment. The building has several hotel that rents out rooms like this. It is better to call to ask for direction before going.